Here is a visual journey through the past two years of my life with my (now) husband, Jesse, as told with 33 layers (32 images and a background color layer). 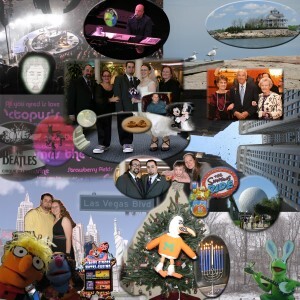 In May 2008, Jesse proposed to me in our living room before we attended the Billy Joel concert at Mohegan Sun (top left: full shot from our seats, closeup of Billy and tiny inset of us that we took with self-timer right after proposal). Not too long after that, I drew his picture as we sat chatting once day (pencil drawing near Billy pics). In August of that year, we went to Orlando (center to bottom right – Epcot, Simpsons Ride and the awesome Kermit statue we brought home, sporting some bunny ears last Easter). For Hanukkah that year, I surprised Jesse by taking him to FAO Schwartz, where they had just opened the Muppet Whatnot Workshop. We are now the proud owners of our very own Muppets, Herman and Lola (bottom left). We have a pretty view out of our apartment window when it snows, as you can see from the pic I snapped during the first snowstorm in our current apartment (bottom right, background). In the midst of wedding planning last summer, we took a tour of the Thimble Islands in Branford, CT (top right). October was wedding time! In the center area of the collage, we have a photo of us with our parents at the wedding (with an image of my father from several years ago added in; he passed away in 2007). Jesse wore custom gray and purple Chucks and I had purple heels – it was so us! Our wedding rings are beautiful, matching two-tone ones that Jesse picked out (shown on two chocolate chip cookies). We had a Groom Mickey and Bride Minnie cake topper that my mom had given us after we got engaged. The smaller, foggy circle was our first dance at the reception. My grandparents (towards top right) had a great time! Love them! Our day wouldn’t have been complete without his brother/best man Lucas (pic under our feet), my sister/maid of honor Christine and my nephew/ring bearer Tommy (in a photo taken last weekend at family party). We went to Vegas for our honeymoon – stayed in Circus Circus (clown in bottom left), laughed as we passed New York New York (bottom left background) and spent many hours traversing Las Vegas Boulevard (sign inset in NY NY pic). The highlight for me was seeing The Beatles Cirque du Soleil show LOVE (images from the theater are left center). The background image in the right center came from the incredible ticker tape parade at the end of last season when the fabulous New York Yankees won the World Series. It was my first parade (and my last, but that’s another story), but Jesse had a great time and that’s all I cared about. This past holiday season (Christmas tree and menorah, bottom center) I made Jesse a Sebastian ornament (inset on tree). He is the mascot for the University of Miami Hurricanes, where Jesse went before transferring to QU. And there you have it – the past two years of my life, as told through photos. I’ll post tomorrow on everything I did to make the collage a reality. Thanks for a awesome post and interesting comments. I found this post while surfing for some free lyrics. Thanks for sharing this article.